The high ground of Hampstead Heath, to the north of central London has a fascinating geology which helped to drive Hampstead’s original development and is also the source of rivers such as the Fleet and the Westbourne. The highest point on the heath reaches some 133 meters above sea level. If you stand on the heath, under your feet will be a thick layer of sand and gravel, known to Geologists as the Lower Bagshot Sands, which at the highest point is 24 meters thick. The thickness of this layer fluctuates across the heath, for example when the shafts were sunk for the Hampstead Underground Station, the layer was found to be only 5 meters thick, and the layer disappears as height descends running down from Hampstead. Underneath the layer of sand and gravel is a layer of sandy clay which extends for 15 meters at the thickest point. Underneath this layer is the thick and impermeable London Clay which extends over much of London. The following map from “Hampstead Heath – It’s Geology And Natural History” by the Hampstead Scientific Society published in 1913 shows the area covered by the Bagshot Sands. Hampstead and the heath can therefore be considered as a sandy peak sitting on top of a layer of thick clay. It is this geology which gives rise to the large number of springs which can be found across the heath. Rainwater can easily pass through the layers of sand before reaching the layer of London Clay which presents a barrier. Water then runs horizontally along the boundary between the sand and clay to come back out from the ground in the form of a spring at the point lower down the heath where the sand layer stops. When emerging from the ground, the water carries with it the properties of the sand through which it has passed, and it is these springs and the properties of the water that have been so important in Hampstead’s development. 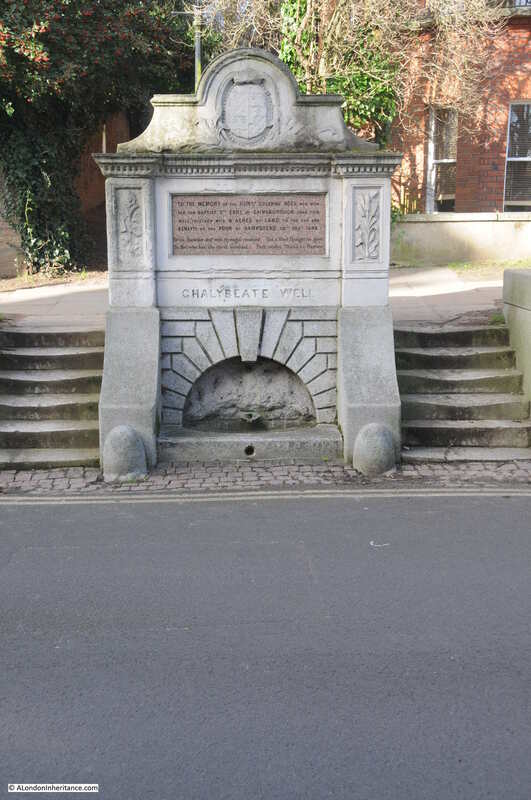 This is the Chalybeate Well in Well Walk, Hampstead. 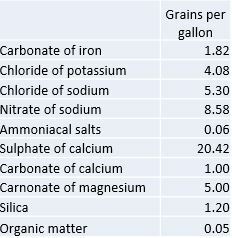 In the context of water, the name chalybeate means that the water contains iron. 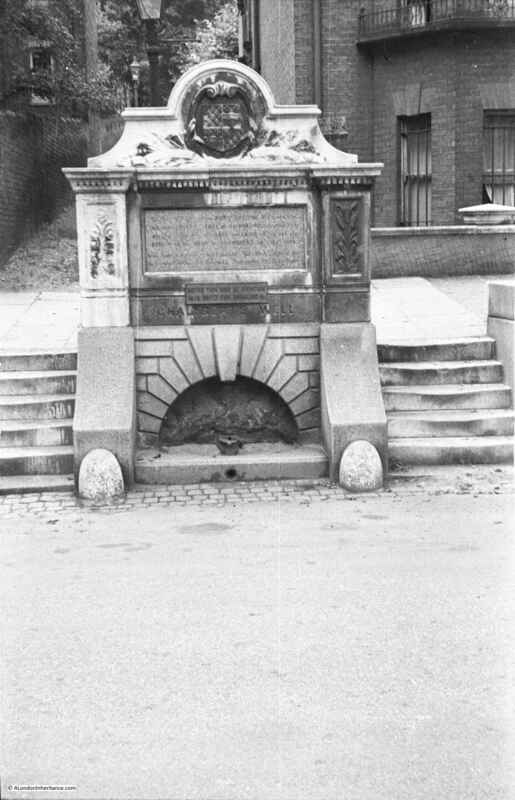 The springs of Hampstead have a long history of providing supplies of water for the rest of London. Conduits were built to channel water from the springs along the heath to the centre of the city. 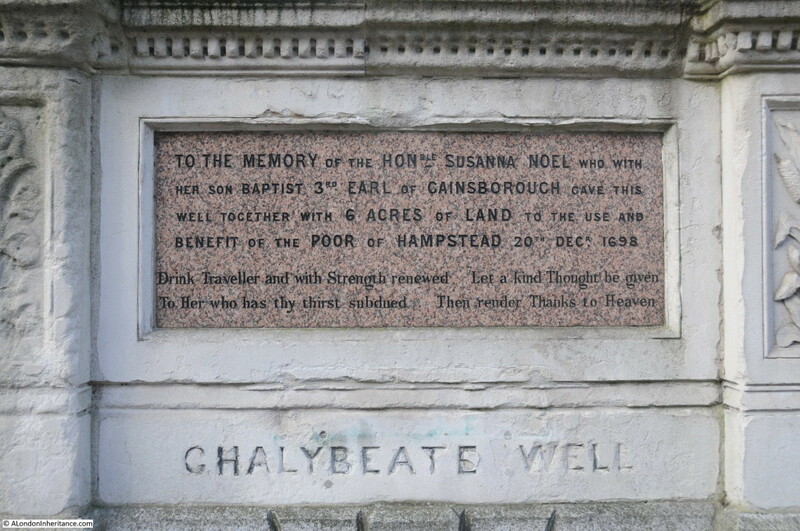 During the search for sources of water, the chalybeate springs must have also been found, and whilst not suitable for drinking water, the high iron content gave rise to the believe that the water had medicinal properties. 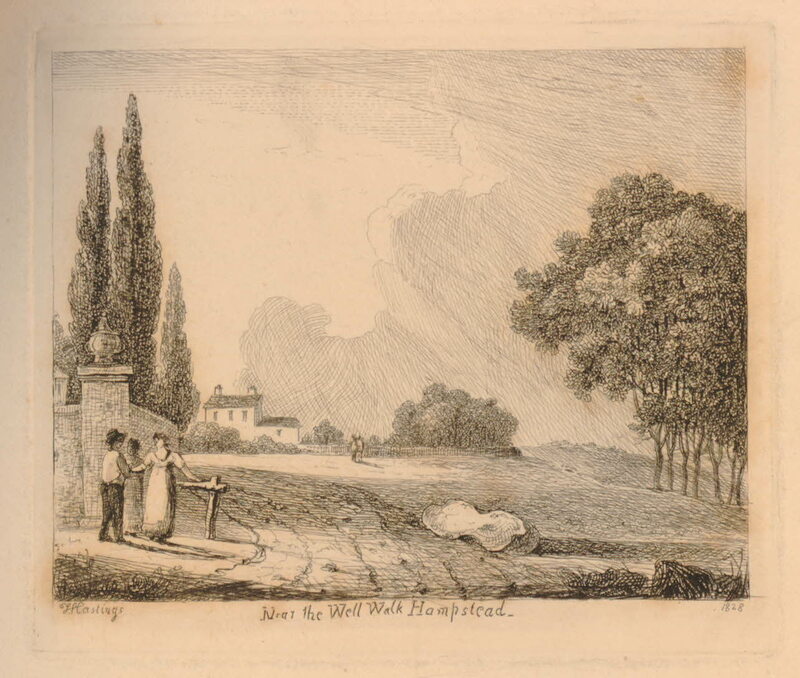 On the 20th December 1698 the infant Earl of Gainsborough and his guardian and mother, the Countess of Gainsborough gave six acres of land in the region of the Chalybeate Well, to be used to benefit the poor of Hampstead. The deed that transferred the land refers to “the Wells lately made there for medicinal waters”. The transfer was to a charity managed by 14 trustees. The land in this area of Hampstead was poor quality and rather boggy due to the number of springs. Despite the gift of the land, there was little from the land that would benefit the poor of Hampstead, apart from the springs and it is these that the trustees started to develop. So the Chalybeate Wells of Hampstead were in competition with those of Tunbridge Wells. It also provides a fascinating insight into the need to guarantee that the waters provided in flasks were original – the use of a sealed ticket with a wolf rampant sounds very dramatic. 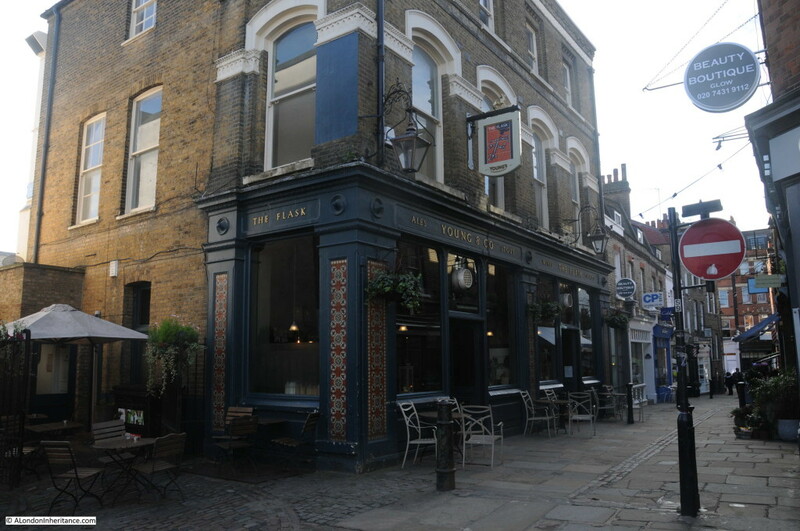 The waters were bottled on the site of the present pub “The Flask” on Flask Walk which leads directly into Well Walk. 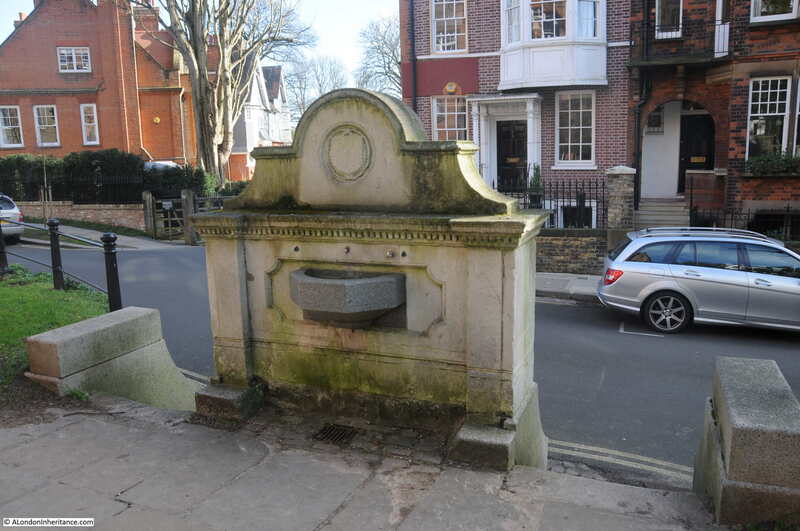 The source of the water that was sold in London was not from the existing Chalybeate Well in Well Walk, the source was a spring and pond (filled in about 1880) about 100 yards further up the hill. As well as the sale of the water in London, the trustees also looked at other opportunities for how they could gain further benefit from the 6 acres of land. On the 2nd June 1701, a John Duffield was granted possession of the land for a period of 21 years for an annual rent of £50. John Duffield must have realized the opportunities that the land and the associated springs provided with their close location to the rest of London. He immediately started building work, constructing buildings that would enhance the local springs with a Great Room or Long Room, Assembly Rooms and a Pump Room. To these rooms were soon added a tavern, chapel and shops along with formal gardens and a bowling green. 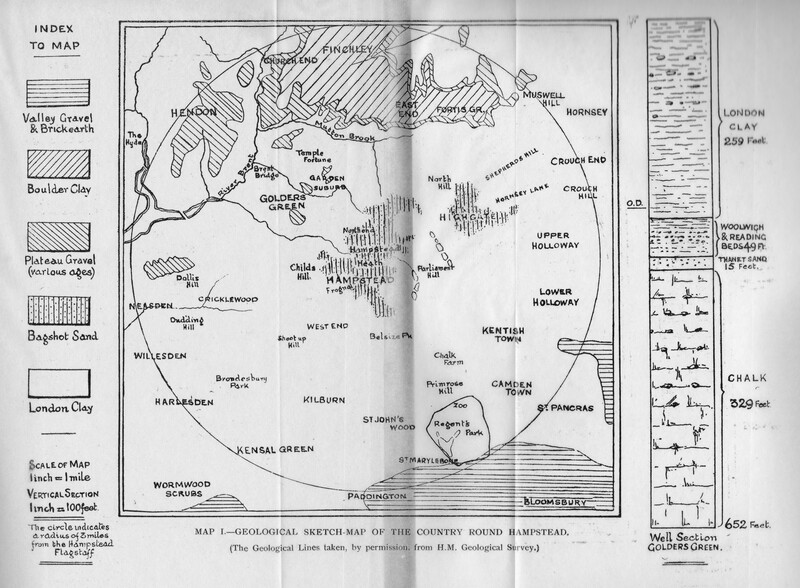 The following map from George Potter’s “Hampstead Wells” published in 1907 provides an overview of the area around 1761. 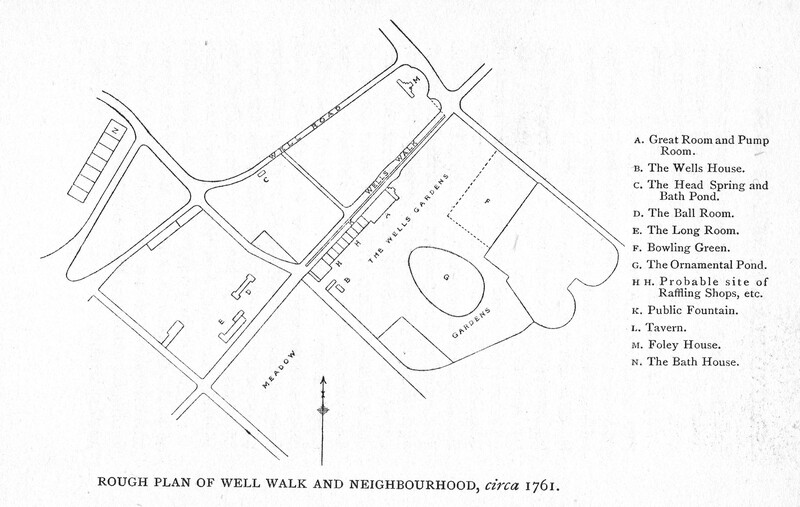 The original source for the Chalybeate waters is at point C. The walkway between Well Road and Well Walk terminates on Well Walk directly behind the current Chalybeate Well so the locations of the Great Room, Pump Room etc. can be positioned along the current Well Walk. A later advertisement mentions that the room will hold 500 people which gives an indication of the size, and also at 1s per ticket the amount of money that the new buildings at the Hampstead Wells were generating. 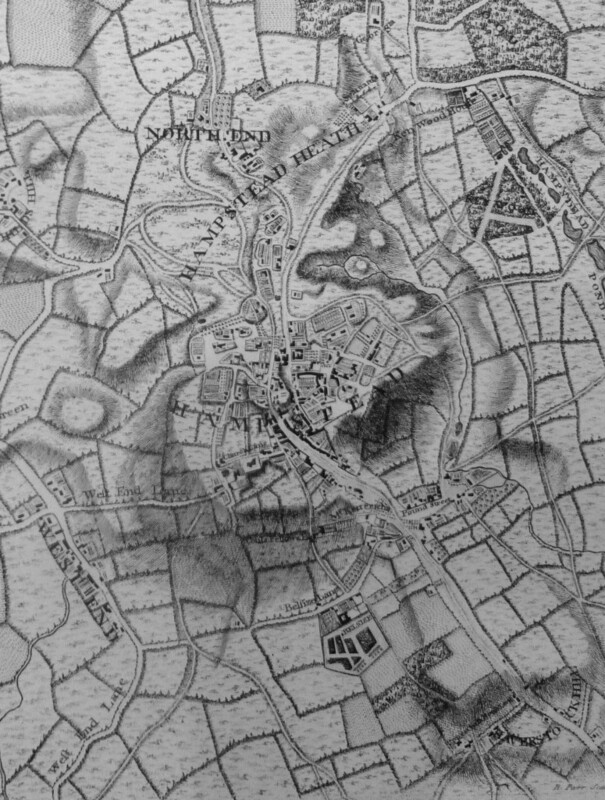 John Rocque’s map published in 1746 shows the village of Hampstead still as a village surrounded on all sides by fields and the heath. The new developments around Well Walk are to the upper right of the village. The rear of the Chalybeate Well in 1949. On the left of the basin is a chain which presumably had a cup attached to allow the waters to be drunk from the basin. The rear of the well in 2016. The chain and cup have disappeared. Just above the right hand-side of the basin is a modern push button which appears to offer a pump-action to bring water to the basin – I tried it several times but there was no water. The chalybeate waters, the Long Room, Pump Room etc. enjoyed a number of years of great popularity with those who could afford to travel and pay for the entertainments, with Londoners flocking to Hampstead. However after a number of years their popularity declined, there were a number of scandals and trouble at the tavern. It was also found that the poor of Hampstead who should have benefited from the original grant of land had not received anything as John Duffield had not been paying his annual £50 rent, and by the 1720s when the situation could not last for much longer, eleven of the original fourteen trustees had died so the trust had also become rather ineffective. After this initial development of the grant of the 6 acres of land, and the chalybeate waters, the area continued under the management of what became the Wells Charity. Continued efforts were made to promote the waters and the entertainments that were provided in the buildings along Well Walk and during the 19th century the houses that currently line Well Walk gradually replaced the 18th century buildings, constructed to promote the spring waters. The original public basin that held the spring waters was on the opposite side of the road from the current Chalybeate Well which was built around 1882. Water has never run freely from the well. Digging of sewers in the road and other building works appears to have disrupted the underground flow of water. Even if water was flowing into the well, it would not be wise to drink. So, despite the new well being constructed, there was very little water and what was available was not very drinkable. The well provided a common source of street names in the area. Chalybeate Well is on Well Walk. 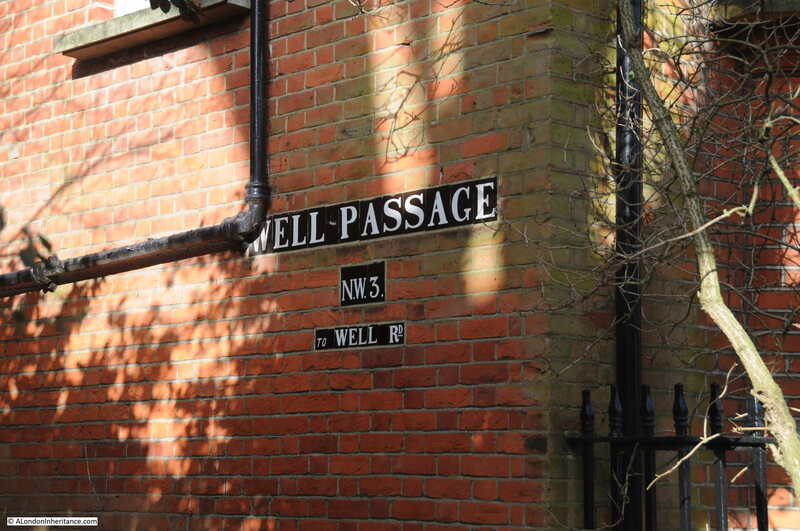 Just behind the well is Well Passage which leads up to Well Road. Hampstead has also long been the residence of artists. 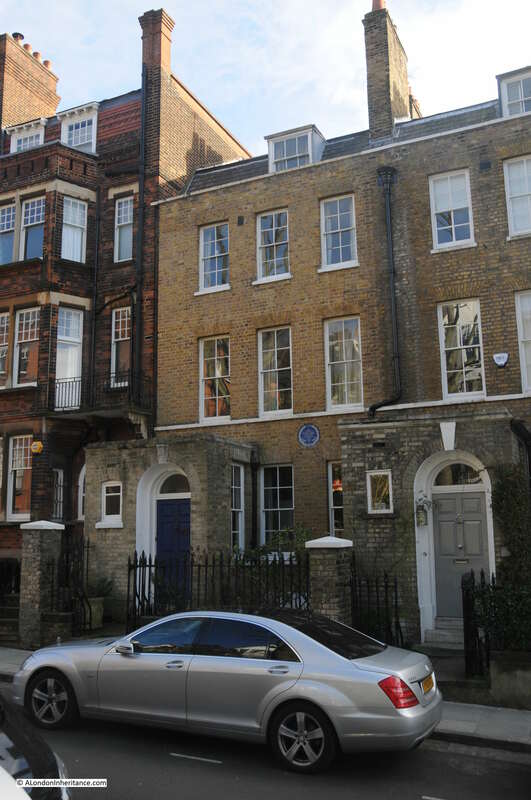 A blue plaque along Well Walk identifies one of the two houses in which the artist John Constable lived in Hampstead. He frequently visited Hampstead in the summer then moved there permanently until his death in Hampstead in 1837. He took the lease on the house in Well Walk from the summer of 1827 until 1834. 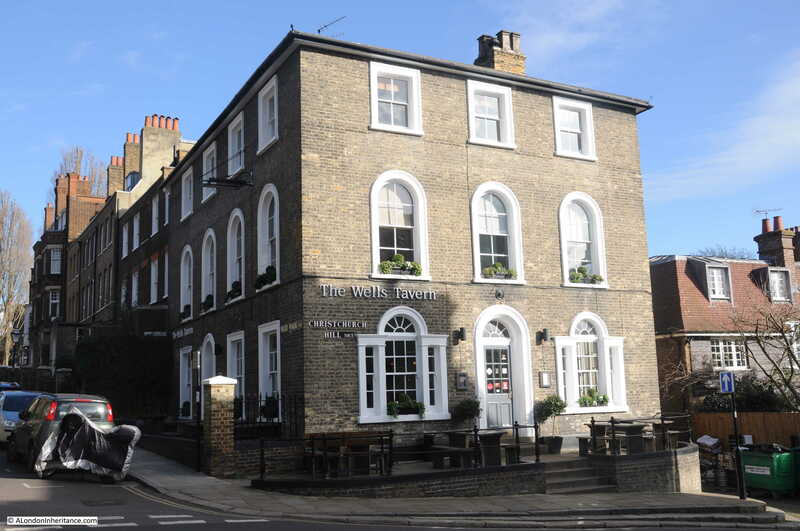 Walking back into Hampstead, at the junction with Christchurch Hill is the Wells Tavern. This was built on the site of the original tavern, the “Old Green Man” which was pulled down in the late 1840s. At the Hampstead end of Well Walk, the road splits into Flask Walk and Gayton Road. Follow Flask Walk towards Hampstead to find The Flask. Both the walk and the pub are named after the flasks that were filled here with spring water ready for dispatch to London. 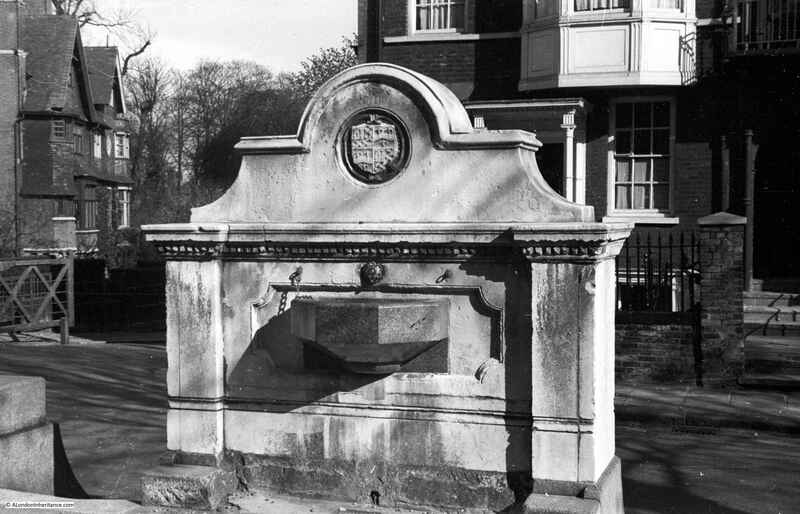 The Chalybeate Well is a reminder of how the geology of a location has played a part in the development of London. The springs helped the early development of laundry services in Hampstead, the waters were channeled to the City through conduits and they have shaped the development and natural history of the heath. I hope to cover this in more detail in future posts (and it provides a good excuse to walk more in Hampstead and visit Hampstead pubs). 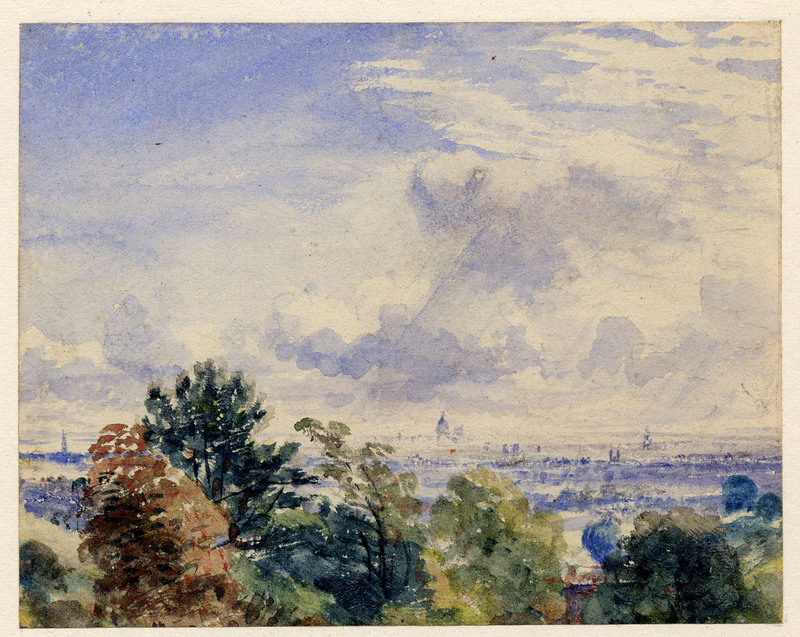 This entry was posted in London Villages, Under London and tagged Chalybeate Well, Hampstead, John Constable, The Flask, Well Walk on February 14, 2016 by admin. Thank you,Admin. I enjoyed reading this post. I have added this to a list of places to visit. Also looking forward to more posts about the area,especially if you are visiting some interesting hostelries. After all, it doesn’t look as if the well will quench a thirst any more It would also be interesting to find out whether there are any ‘poor’ people in Hampstead and if they receive anything from those charities you mentioned? Yes indeed the Wells and Campden Trust still exists and there are many council flats in Hampstead ( Wells House, Luton Terrace). Christopher Wade’s For the Poor of Hampstead ( sited as a reference) traces this history. The well was changed about 18 years ago to have Thames drinking water flow through ( a private individual took it upon her self to organise this) it but seems to have stopped working a few years ago. Very interesting article. I think it would be a great idea to get the waters flowing again in this Well. Where to start? Great article. 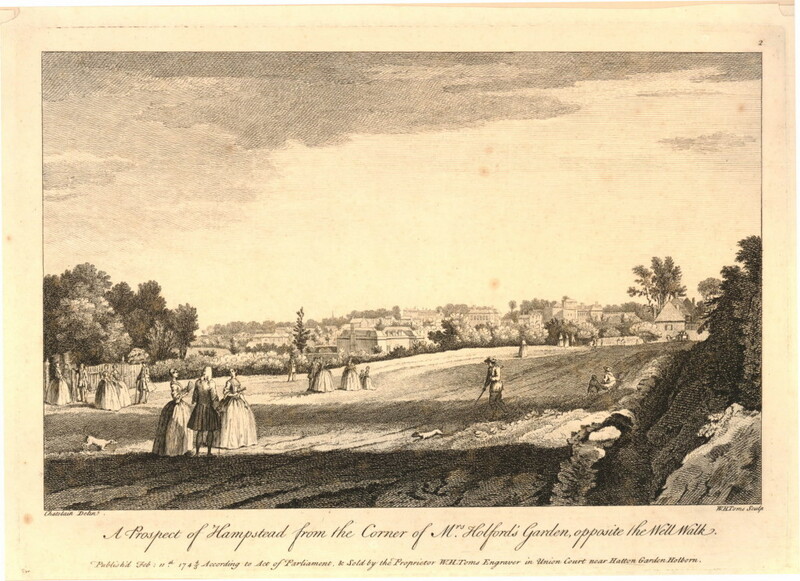 Do you have any info about Hampstead Hill Gardens? I have an interest having been born in that location.